The menu offers considerable choice in regards to almost anything you can think of and the prices are quite fair. 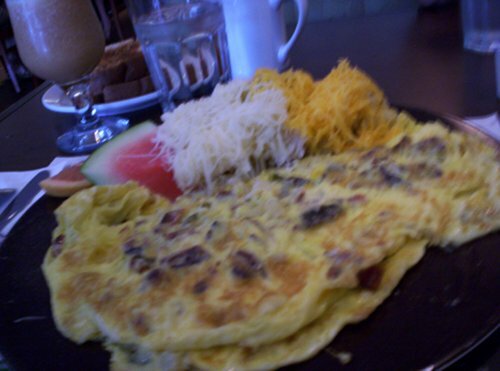 There are almost a dozen omelette choices with prices ranging from $5.50 up to $8.95. The bacon omelette ($6.50) is quite filling and tasty. 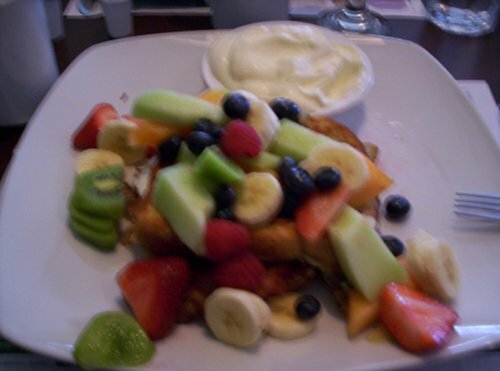 The health section (Déjeuner Santé) has some good healthy choices with 2 eggs, a bagel, yogurt and a fruit cup ($8.95). The fresh fruit options have a fruit cup ($4.95), fruit plate ($7.95) and a fruit with yogurt and a fruit cup ($8.95). The fresh fruit options consists of a fruit cup ($4.95), fruit plate ($7.95) and a fruit with yogurt or crème Anglaise ($8.95). There is also a side order of potatoes ($2.00) that is unbelievable. The potatoes are mashed and there are 2 shredded cheeses (cheddar and/or Swiss) on it; it’s really amazing and the price cannot be beat. The fruit drink ($3.25) is a mix of melon, cantaloupe, strawberries, bananas and possibly some other fruit; the taste is average, nothing to write home about, but the size and price is fair. Coffee is a bottomless cup and they refill quite often. 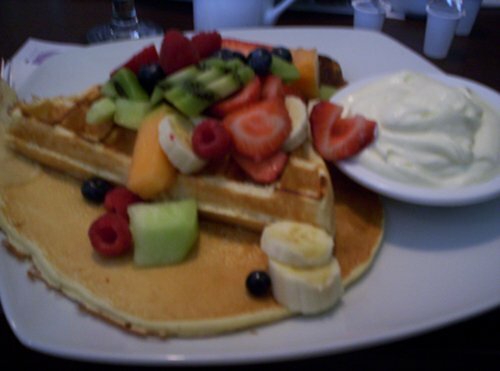 The Special Papy ($8.95) comes with 1 French toast (really good, not too heavy yet very tasty), 1 waffle (good), 1 crepe (not too thick), crème Anglaise on the side (I was never a fan of crème Anglaise so you need to judge it for yourself), topped with a mountain of fruit, and it comes with coffee. The special Charly is quite amazing; it consists of 2 French toasts, eggs, bacon, cheese and coffee, but the most amazing part is that the egg and cheese are in the middle of the French toast like a grilled cheese sandwich. The service is good and we were seated quickly. I can see how some line-ups can form since it tends to get full pretty fast even though it’s quite large, but there’s a quick turnover so I would not worry about waiting too long. Coffee refills were frequent, although we waited a while for our bills. There are some good vegetarian options: the pancakes and waffles are generally meat free, the Déjeuner Santé is a good option, the omelettes have some vegetarian selections and there are 4 different fruit cup/plate choices. Although if you are a strict vegetarian who worries about meat bi-product or food cross contamination then you will have to ask as it seems there was no mention of this on the menu. As well if you are a strict vegan it is best to go for the fruit options since the Déjeuner Santé has eggs in it. As always please specify your dietary restrictions to the person serving you. Allo Mon Coco is well worth a visit and if you are in the area do not pass up the chance to try it out. The parking is plentiful, prices are fair, menu ripe with options, and it is wheelchair accessible, so bonus points for that. Excellent review, Bert. Glad you liked it. Can you please provide me with the hours that breakfast/brunch is served at Allo Mon Coco. what do they have for vegans? Fruit dishes last I checked, it’s been a while since i’ve been here but there should be a couple fruit dish items. i want to know the price for the franchise please. 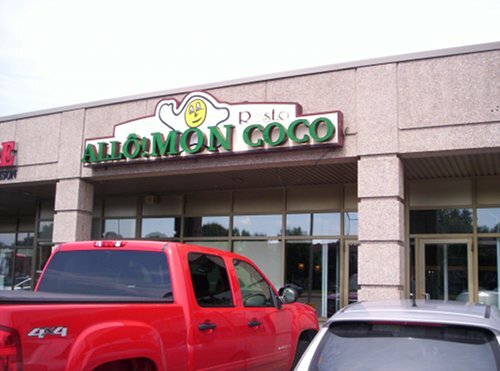 I would like to know if in a near future you will open a Allo mon coco in Lasalle. Sorry for my spelling maybe not write I am French! Nice place too noisy. Good service and food. Lots of hidden costs for switching foods. I don’t mind paying but let me know in advance. Bill too high. Don’t think we will go back. My wife’s plate came with a dead fly on her sliced tomatoes. She lost her appetite and was unable to eat the second “replacement” plate that the waitress brought her. They still charged the full amount of her plate on our bill! The owner didn’t even come out to discuss the situation or offer her plate for free. We will never go back to such a disrespectful, careless establishment!